Golfetto Sangati, owner of the brand name Berga, is very experienced in the handling of grain and other bulk products. 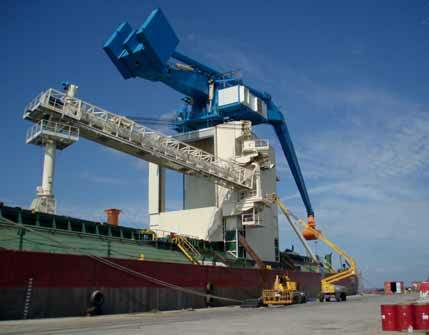 Golfetto Sangati (GS) has long and extensive experience in ship-unloading. At the beginning of its activities, GS was manufacturing and supplying pneumatic type unloaders with capacities up to 600tph (tonnes per hour). Due to the increased demand of higher capacity unloaders, GS has included in its product range a continuous mechanical unloader, chain type, with a capacity up to 1,500tph. It is very well known that power consumption per tonne for this type of unloader is about a third of that used by traditional pneumatic systems. Shiploaders are also part of the GS range. The company can provide its clients with mobile or fixed installations with kick- in/kick-out of the vertical pipe. A specially designed feeder makes it possible to load the ship through the hatch dust-free. One of GS’s recent projects is a grain terminal for shiploading at the Port of Costanta in Romania. The client, Canopus, is a JV between TTS of Romania and Cargill of the US. The plant has a 300tph intake system from trucks, as well as silo loading. The silo unloading, as well as the transfer to the jetty where the mobile shiploader is located, are rated at 800tph. This loader, capacity 800tph, is rail mounted and it receives the grains from a belt conveyor along the jetty that feeds a vertical chain conveyor. The product is than discharged into a belt conveyor located on a swivelling boom. At the end of the boom, there is a telescopic pipe made of hardox steel that with the kick-in/kick-out movement, by two hydraulic pistons, allows to reach all hatch corners. At the end of the telescopic pipe there is a rotating feeder with dust suppressor. The plant is under erection and is due to have been commissioned by the time this issue goes to press.